Neuilly-sur-Seine, France, September 14, 2016 - Bureau Veritas, the leading international classification society is supporting the adoption of clean fuel LNG through the classification of both vessels in the world's first ship-to-ship LNG bunkering operation between two independent ocean-going vessels. On September 3 2016, Terntank Rederi's M/T Ternsund bunkered LNG from Coral Energy, a Dutch small scale LNG vessel owned by Antony Veder and chartered by Skangas. The operation was carried out at the entrance to the port of Gothenburg. The 15,000 dwt Ternsund is the world's first LNG-fuelled newbuilding oil/chemical tanker. It was built under BV class at Avic Dingheng, China and delivered to Terntank at the end of June 2016. Coral Energy, which has a capacity of 15,600 m3, is also built to BV class and was delivered in 2013. Using liquefied natural gas rather than heavy fuel oil lowers polluting emissions, making it the straightforward route to compliance with stringent low emission areas established in Northern Europe and North America. Ship-to-ship bunkering is considered by the industry as the key to adoption of LNG as a marine fuel. 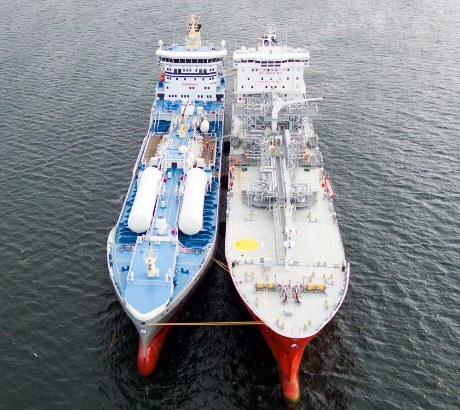 It is the standard bunkering mode adopted by the shipping industry for refueling ships, but last week's operation is the first time ever that a cryogenic fuel has been ship-to-ship bunkered. It opens the way for ship-to-ship bunkering around the world, as unlike a fixed LNG terminal, the bunker vessel is not dependent on location, and can offer LNG as fuel to any receiving vessel. "The ship-to-ship bunkering between Ternsund and Coral Energy represents asignificant milestone in the adoption of LNG as marine fuel. Bureau Veritas has facilitated this major step through our dedicated rules and active participation in development of new international guidelines that encourage the adoption of clean fuel and enhance designs for new clean vessels. This first LNG ship-to-ship bunkering operation will soon be followed by other LNG ocean-going bunker vessels classed by Bureau Veritas. These include ENGIE bunker vessels operating from Zeebrugge, and a Sirius Veder Gas AB new bunker vessel under construction at Dutch shipyard Royal Bodewes."